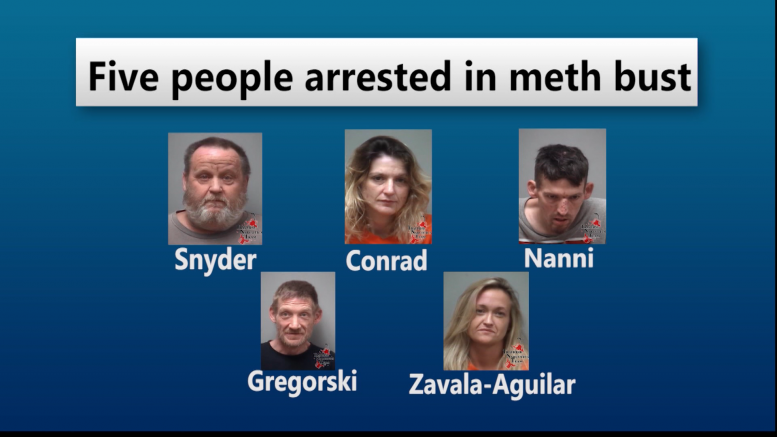 Five people were arrested in a meth bust in Benzie County. All have been charged with possession of methamphetamine. Police in Benzie County arrested five people this weekend involved in a meth ring. Local law enforcement executed a search warrant in Beulah Thursday evening. They discovered a man who had overdosed. He was immediately rushed to the hospital. Another individual in the home attempted to get rid of meth–related evidence. About eight ounces of crystal meth were found, as well as a functioning butane oil lab and drug distribution materials. More than $8,000 in suspected drug money was confiscated from the search. 36-year-old Michelle Conrad of Elberta. Each was charged with possession of methamphetamine, among other drug–related crimes.